Picture your trailer frame like a plank sitting on a couple of sawhorses. The sawhorses represent the stabilizing jacks and assume two or more of you are walking back and forth on the plank. Assume the saw horses are very near the ends of the plank. Then as you walk back and forth the plank has a lot of flex and bounce. The biggest movement is when you are halfway between the sawhorses. So if you move the sawhorses closer to the center then the bounce is reduced. The tires and springs on the trailer will dampen this movement, but still allow it. For this reason it is best if stabilizing jacks are place several feet in from the ends of the trailer. Approximately four feet in seems to work well on most trailers. Now if you take and move one of the sawhorses in too far and one of you walks out on the end of the plank, you have a diving board effect. Not only does the end of the plank move up and down but so does the center of the plank. Again, the tires and springs on the trailer will dampen this movement, but still allow it. 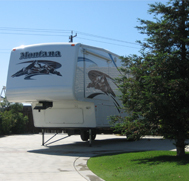 This can also happen on a fifth wheel where the front of the trailer can be 6-10 feet past the front drop legs. Another cause of bounce is stabilizing jacks that flex and act like stiff springs. They support the frame, but allow up and down movement. Unfortunately, there are many “stabilizing jacks” on trailers that behave this way. The basic scissor jack is extremely good at eliminating up and down motion at the point it is installed. Based on the frame design and length, two or three pair of scissor jacks will reduce the bounce to a very acceptable level. Shake is basically caused by the side to side and front to back play in almost all the “stabilizing jacks” used in the RV industry today. Basically it is like sitting on an old stool where all the legs are loose. Since it is very difficult to modify existing jacks so they do not have any side to side play, some sort of lateral support needs to be applied to the frame to reduce this movement. The tripod (fifth wheels) and wheel chocks are the most common application to reduce this movement. They reduce the movement, but normally not to the level the trailer feels firm or stable. 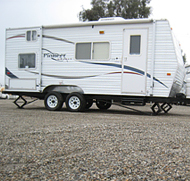 The reasons vary, but are generally caused by the difficulty in setting up the tripod due to varying king pin heights and uneven ground, poor tripod design, spring and tire movement between the chocks and the trailer, and poor lateral support near the rear of the trailer. Just for the sake of comparison let’s say that this method will remove 80-85% of the movement. Several bracing systems have come on the market that brace the trailer frame to the ground or a jack, greatly reducing the side to side motion and some of the up and down motion. They may utilize two to six braces depending on the manufacturer. Some of the systems mount permanently on the trailers and are deployed when the jacks are extended. These systems may provide from 80-95% plus reduction of movement. From and engineering standpoint only 3 properly designed and installed braces are required to reduce the side to side movement to the minimum level on a parked trailer frame. Copyright Hanscom Enterprises, LLC All rights Reserved. 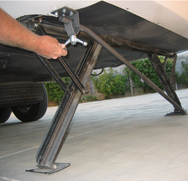 How to check a trailer brace or bar stabilizer that has excess movement. 1. Set up the trailer and bracing stabilizer as per manufacturer’s directions. 2. Have someone push, bounce, or shake the trailer to make it move. 3. While the trailer is moving inspect each bracing component, fastener, and jack base for movement. If any of these have movement then that will allow the trailer to move. The most likely problem for a 6 brace system would be a loose fastener, loose locking handle, a chassis attachment that is not solid (such as a loose bolt, weak cross member, or storage compartment bottom), loose pivot points due to not taking the all the play out of the braces, a moving jack base, or a jack that flexes. The most likely problem for the STEADYfast® 3 brace system would be loose locking handle, loose locking bracket, loose swivel clamp, a moving footplate, or a jack that flexes.